Fall Tennis 2014 is COMPLETED. 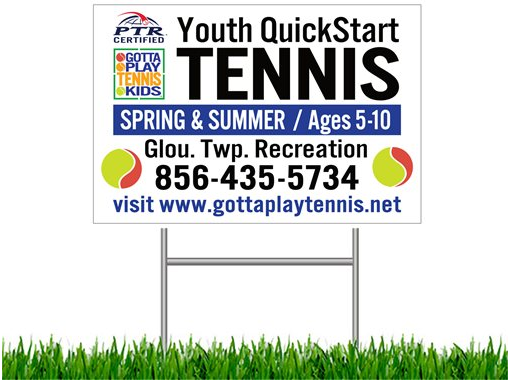 Register for the fall session of QuickStart Tennis (ages 5-10) in Gloucester Twp. Please take a moment to read this if you are in any way interested in the safety and health of our children. Football has the highest number of head injuries in high school sports per year, with 55,007 cases. Girls' soccer is second, with 29,167. REFLECTIONS: What a great shot. Did you mean it? While on the court last week working with a student developing their game, they were successful at hitting some quite well-placed shots. Knowing the ability level of the student, I was urged to ask the logical question after they laid the ball down with such apparent precision. Did you mean to hit that, or did you just get lucky? I will be the first to admit that hitting a winner of any sort is a great feeling. And if luck plays a role in that captured point, then so be it. Even if the ball came from the thin frame area and not the huge string-bed, I'm convinced it was earned. After all, you did pay for the entire racquet did you not? I'm also not so sold on the idea of apologizing for a flubbed shot that landed in a winning spot. Did I mean to win that point? Yes I did. Does it really matter that much if the hit was clean or not? A shot was attempted, the placement was favorable, and the point was won. I do not consider this to be poor sportsmanship as long as I do not gloat about it. Should I be sorry I won the point. I think not. If so, then why don't I apologize every time I hit a cleaner winner. Where do you draw the line? My point is really not about sportsmanship however. I'm merely distinguishing the difference between CHOICE and CHANCE. The better the player, the more likely a shot is hit with a purpose. It may be to win the point outright, or it might be an interim shot to gain a better foothold in the rally. Regardless, if I hit a winner by CHANCE, it is still called a winner. But as a player, I need to realize that I cannot come to depend on such luck is I am to be successful. When someone on a tennis court develops the ability to make conscious decisions about each and every stroke, and most shots are hit with a PLAN and not a WISH, they have achieved some relatively good tennis chops. Then there will less chance of needing to say "I'm sorry" after winning the point. NOTE: Balls that touch the line are considered "in". Whatever intervened with the impending rainy weather we will never know. 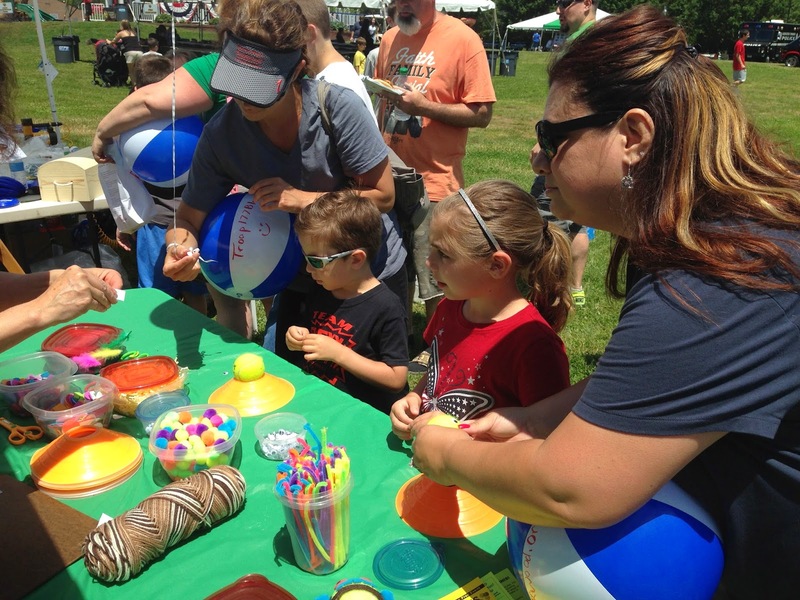 Perhaps it was the gods taking pity on us for all the planning of the event, or it was because of the extensive court setup across all four of the Gloucester Twp. Community Park courts, or maybe we were spared due to all our efforts to promote Tennis Family Fun Day 2014 to the community. Regardless, the rains did hold back and we offered what we think everyone involved will recall as a very fun time for kids and their families. 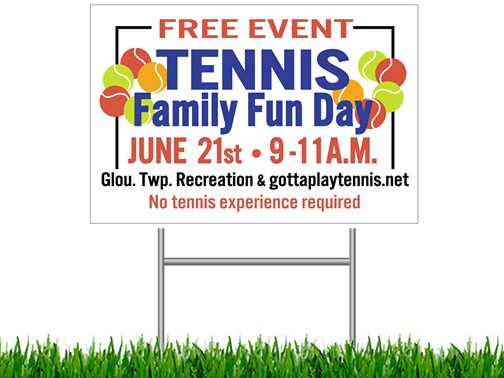 This totally free event, the third of its kind, was held June 21st on the only blended-lines kid-sized public courts in all of south jersey. 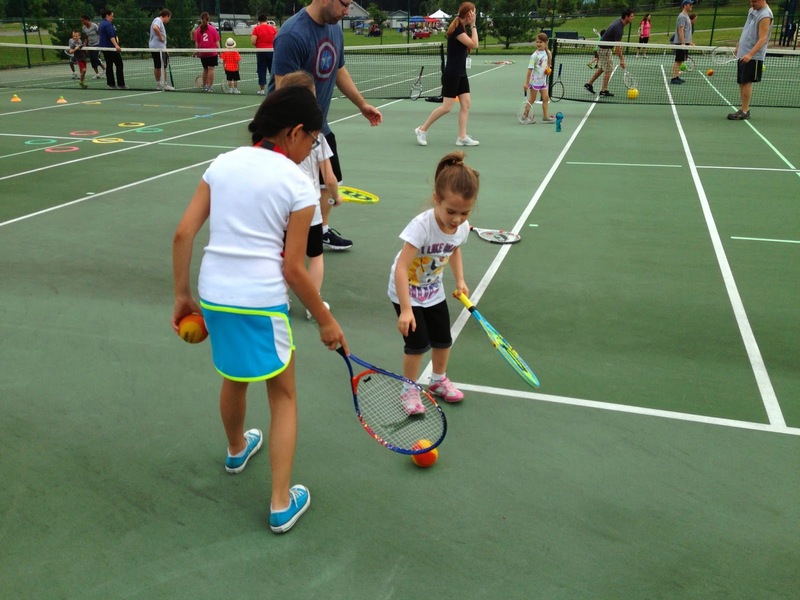 Various tennis-related activities and games were designed to give those in attendance a snapshot of what the QuickStart tennis programs–available from Gloucester Twp. 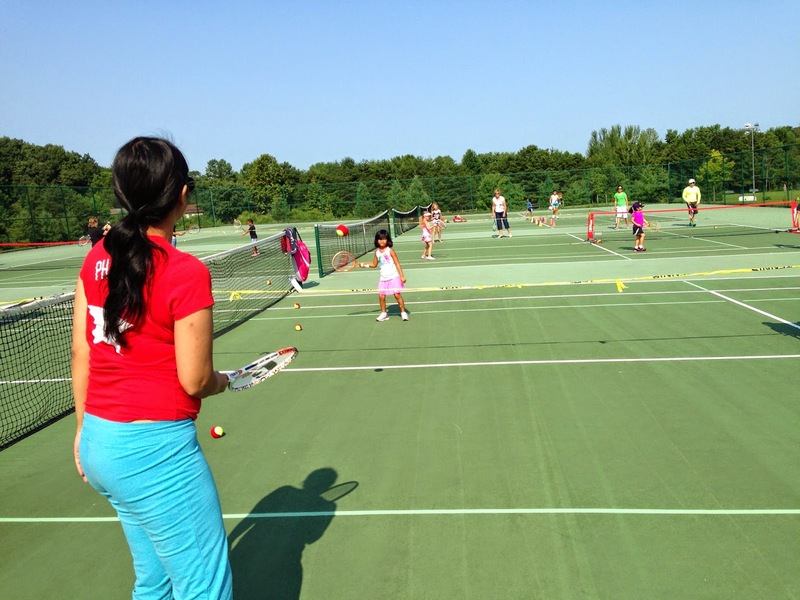 Recreation and Gotta Play Tennis Kids™–resemble during the spring, summer or fall sessions offered throughout the year. 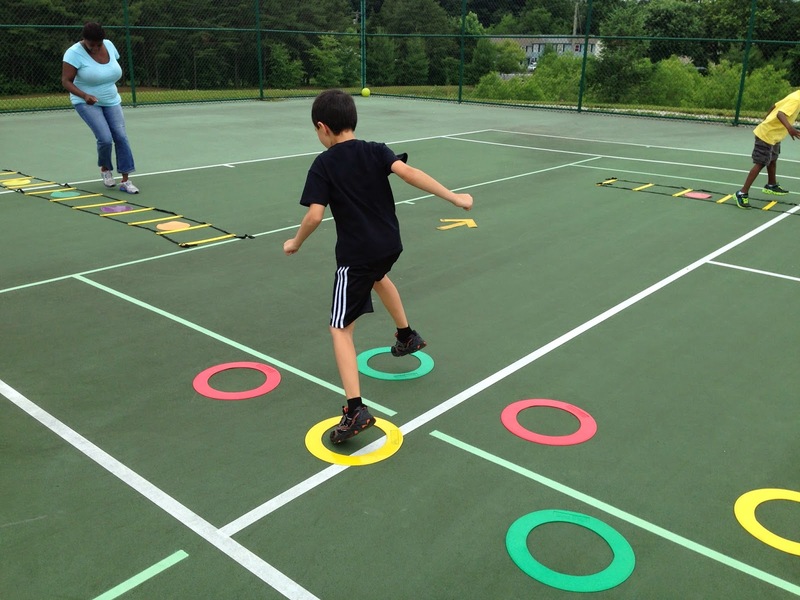 Everyone had a great time as they moved from one station to another using either koosh balls, cones, rings, racquets, and various types of balls. 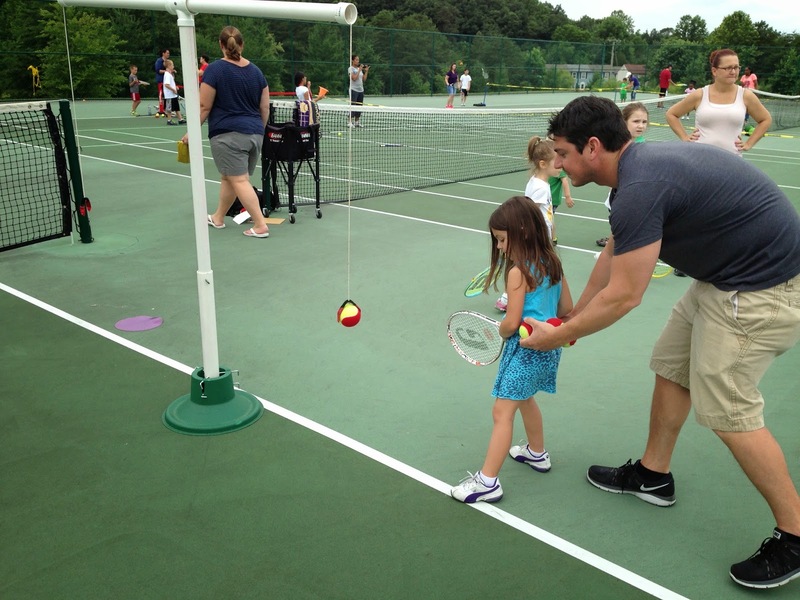 With the assistance of a few current tennis students as volunteers, kids as well as their parents and siblings got a chance to experience some of the foundational skills we emphasize that help players gain quicker success on the court. If you were one of the over 20 families in attendance, we hope you had a great time and enjoyed this free community event. If you did not visit us, why not still consider some of the upcoming programs available this summer through Gloucester Twp. 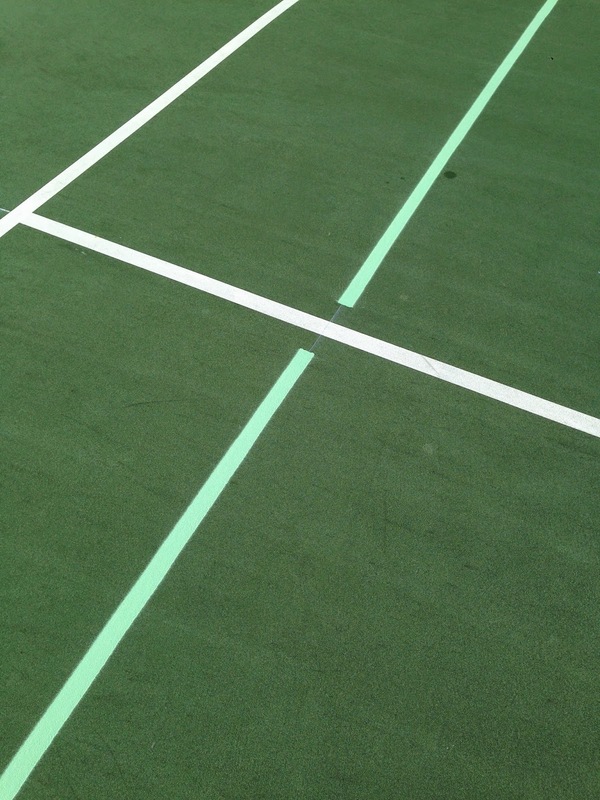 Recreation (download the Summer 2014 newsletter for details) and Gotta Play Tennis Kids. These include 6-week summer Saturday sessions for ages 5-7 and 8-10 as well as two 3-evening camps beginning on June 30th. No previous tennis experience is necessary and Gotta Play Tennis Kids provides all of the equipment. Registration is handled at the Gloucester Twp. Recreation Center. Call 856-435-5734. The smiles of those walking by our location at Veterans Park were beaming almost as brightly as the sunshine’s rays on Gloucester Twp. Day 2014. 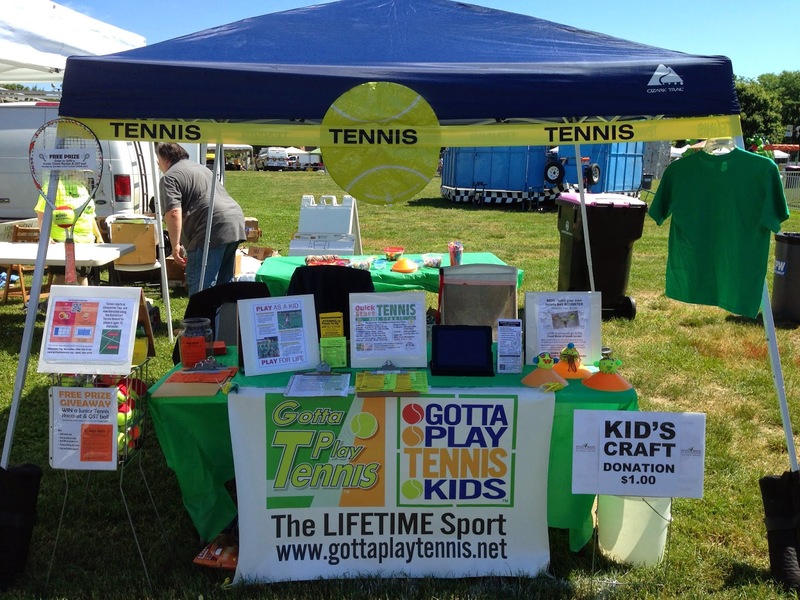 We had the opportunity to meet quite a few parents and their kids as we displayed information about our upcoming summer programs at the Gotta Play Tennis™ and Gotta Play Tennis Kids™ table. Mostly, we really wanted to let more of the community know that there is an alternative sport or even perhaps an off-season cross-training activity that can provide both fun and skill building. For more information on upcoming sessions, please contact the Gloucester Twp. Recreation department at 856-435-5734. In addition to our sharing of materials that both celebrate youth tennis and provide schedules for the next few months, we offered something new this year. 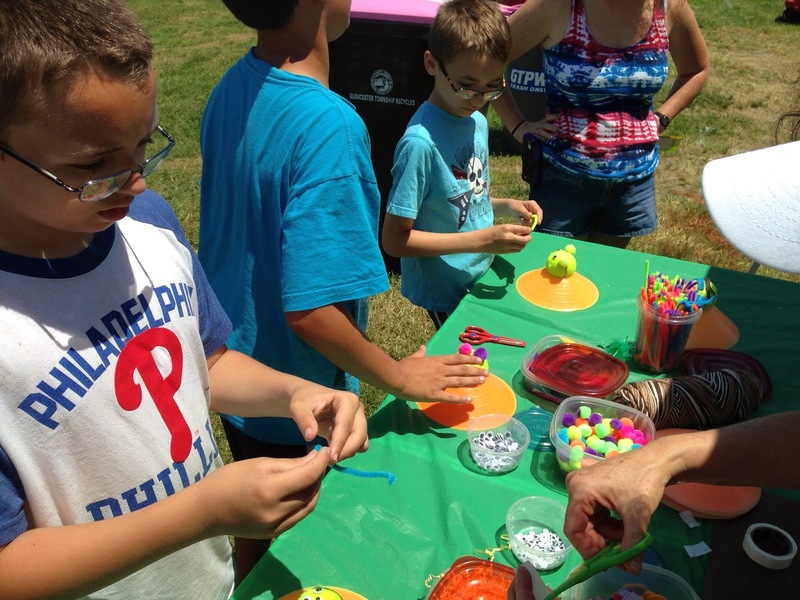 With the support of the South Jersey Food Bank of South Jersey, we provided a kids craft table where children could make something we call a “Bounster-a monster that bounces.” Excited kids worked with us and their parents to create their own unique designs built upon a tennis ball as the base. A slit was already cut for the mouth making it a natural puppet by squeezing along the sides. We asked a minimum $1 donation for the charity as we ourselves supplied all the materials at no cost. Some very interesting creatures were born, and every dollar goes to helping fight hunger in South Jersey. According to their statistics, a part of what drew us to them for this venture, was the fact that in 2013 alone the Food Bank of South Jersey distributed over 10 million pounds of food and responded to more than 1 million requests for food. They can be reached at http://foodbanksj.org/ if you can help with donations, volunteering or if you yourself are in need of assistance. With school soon coming to a close, it is that time of year to consider what the kids can experience over the summer. Why not make tennis, the lifetime sport, a part of that discovery. 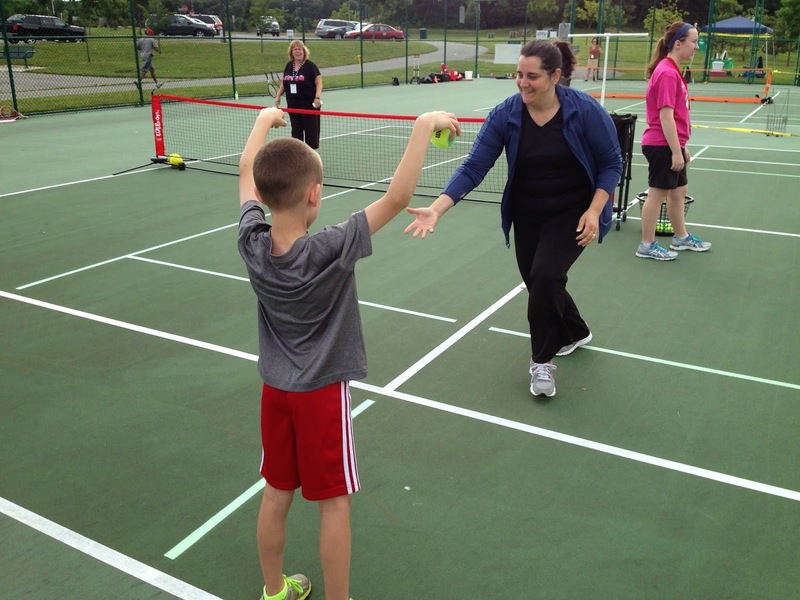 Working with kids in the introduction and development of tennis is a wonderful experience. But like any other skill, facilitating instruction requires continual learning and reinforcement. 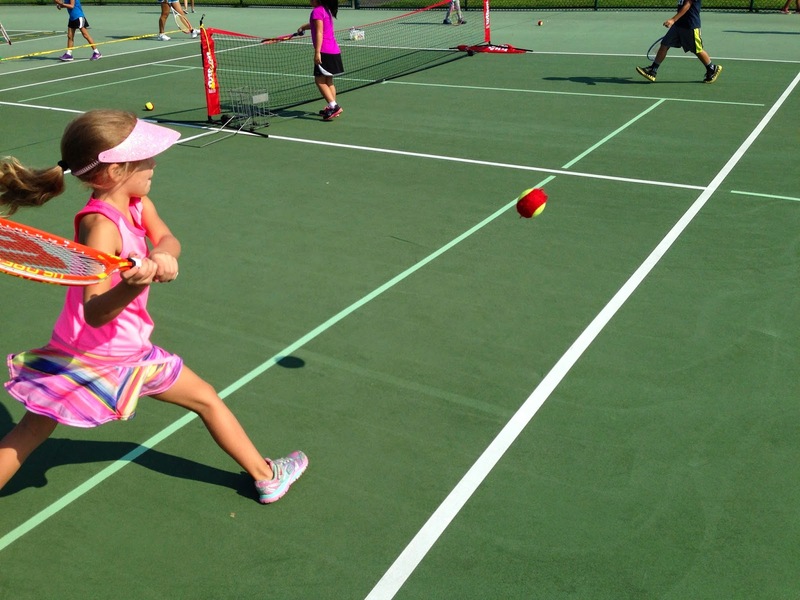 The following is our most recent due diligence in continuing to grow as tennis mentors. 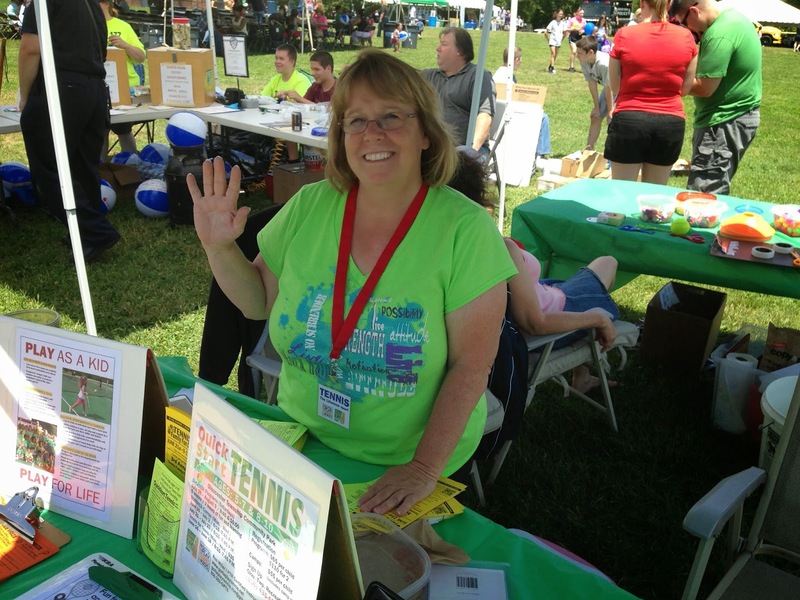 NEWS (local): 3rd Annual Tennis Family Fun Day 2014 in Gloucester Twp. Gloucester Twp. Recreation and Gotta Play Tennis Kids™. No tennis experience is required. Enter the FREE drawing for a Jr. Tennis racquet. Above program time slots assumes minimum registration for each program. Programs (age groups) may be combined to accommodate low registration and time slots will be adjusted. 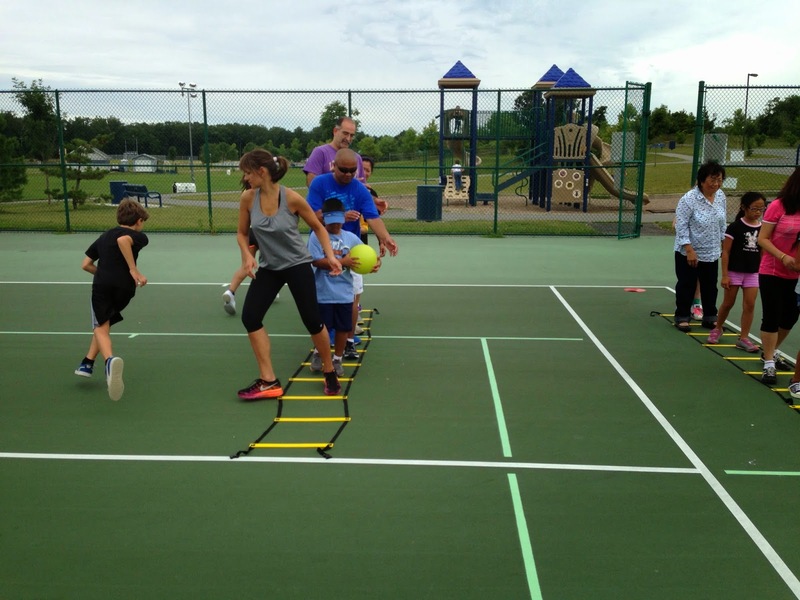 A tennis system designed to encourage the love of TENNIS - and help develop skills in young children — by bringing the sport down to their size. "Great class! My son learned a lot and looked forward to the classes." Why then do we react so negatively to our simple unforced errors? Why do most of us assume that the better players we become, the less mistakes we make? 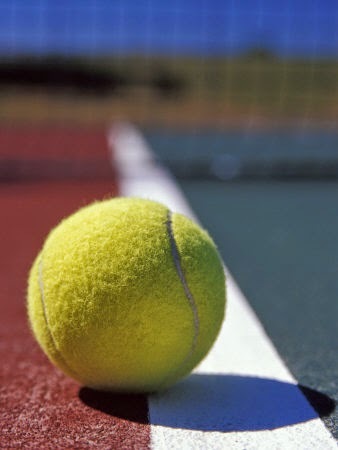 Although tennis may be simply a seasonal sport to some, matches and tournaments take place in professional tennis almost non-stop all over the globe. After all, there is always nice outdoor weather in some location, on any day in the calendar, around the world. The only time of year that racquets have a chance to breathe a sigh of relief from those named Nadal, Federer, Murray and others is during the holiday season. The ATP World Tour Finals played in London ends around mid-November, and the ATP men’s tour picks up again with tournaments in Brisbane, Doha and Chennai at the end of December. But all these aforementioned events focus on the individual efforts of each player who essentially represent only themselves and perhaps their tight-knit group of coaches, physios, and trainers. 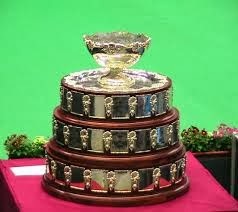 Then we reach the end of January and run into the premier international team event in men’s tennis called Davis Cup. For the uninitiated, the International Tennis Federation (ITF) runs this annual contest between teams from competing countries. Beginning in 1900 as a challenge between Great Britain and the United States, 2013 showed 130 nations in-the-running for this prestigious trophy. And you thought the Olympics were the only international venue for representing one’s country in competition? Each elimination round known as a “tie” consists of 5 “rubbers” or matches. These are played in 3 days and usually on a Friday, Saturday, and Sunday schedule. The winner of the tie is the nation which wins 3 or more of the 5 rubber. On the first day, the initial 2 rubbers are singles which are usually played by each nation's 2 best available singles players. On the second day, the doubles rubber is played. 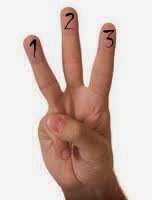 On the third day, the final 2 rubbers are typically reverse singles, in which the first-day contestants usually play again but swap opponents from the first day's singles rubbers. Playing in sport for one’s country is an honor for the few players given the opportunity as the teams are as small as 4 players. Even though each brings their own element of talent and skill to the matches, it is still the team effort that prevails. This concept of individuals competing for the overall benefit for the team is not such a foreign concept in tennis as many might imagine. All across the country, high schools and colleges have tennis teams who train together, strategize together, celebrate together in victory and console each other in defeat. Tennis for these individuals is a team sport not much different than any other. The squads may be smaller, and the one-on-one or two-on-two format may not mirror the volume of kids on the soccer, baseball, or football fields. But at the end of the day, teams win or lose as a team with each member doing their best for the common goal. Even nationally we have the format known as World Team Tennis, a co-ed professional league played with a team format all across the United States. Our local team is the Philadelphia Freedoms for whom a song was written and performed by the Bernie Taupin-Elton John pairing as a favor for then tennis-star Billie Jean King who headlined the team in the 70s. Give yourself a high-five if you knew we had a tennis team to stand behind and pull for just like the Flyers, Eagles and Phillies. As we look again internationally at the great first round matchups in Davis Cup competition with last year’s winner the Czech Republic vs. the Netherlands, Japan vs. Canada, Germany vs. Spain, France vs. Australia, Argentina vs. Italy, Kazakhstan vs. Belgium, Serbia vs. Switzerland, and our own USA vs. Great Britain, I hope that parents of young children remember that tennis can be both an individual and team sport when seeking an athletic activity in which to involve their children. It is the sport that can last them a lifetime. But perhaps even more relevant is the fact that parents and kids can play tennis together on public tennis courts needing very little equipment. It provides healthy, fun and inexpensive entertainment for the entire family who can perhaps even divide into teams. Just a word of advice to dads: moms team should always win.